Showing 1 - 1 of 1 Products for Suspension Leveling Kit. Black; 2 in. Lift; Includes 2 Spacers; 2 Count 5/8 in. Coupler Nuts; Wheel Alignment Needed For Tire Size 33 in. Daystar Leveling Kits work within the factory suspension design, meaning that we work within the factorys design parameters to achieve an increase in ride height that levels the stance of the vehicle. Because we work within the factorys design, there are not a bunch additional modifications involved. Everything needed is included in the kit; theres everything you need and nothing you dont. If there are extra items required, such as longer shocks, its clearly stated in the application description. Torsion bar applications require their own unique approach to leveling the stance of the vehicle. With torsion bar applications, we supply new forged torsion keys that meet or exceed factory specifications. These torsion keys have been re-indexed to increase ride height up to 2in. and level the stance of the vehicle. In select applications, extended shock brackets are also included. 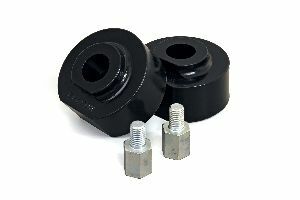 Daystar Leveling Kits include only front lift components to level the stance of the vehicle. We also offer Budget Boost kits, which provide a mild increase in ride height and are more economically priced than our Leveling Kits. Since our start with Leveling Kits in 1995 weve used our expertise to develop over 300 applications that span all of the popular trucks and SUVs...do your homework and youll see that weve done ours!